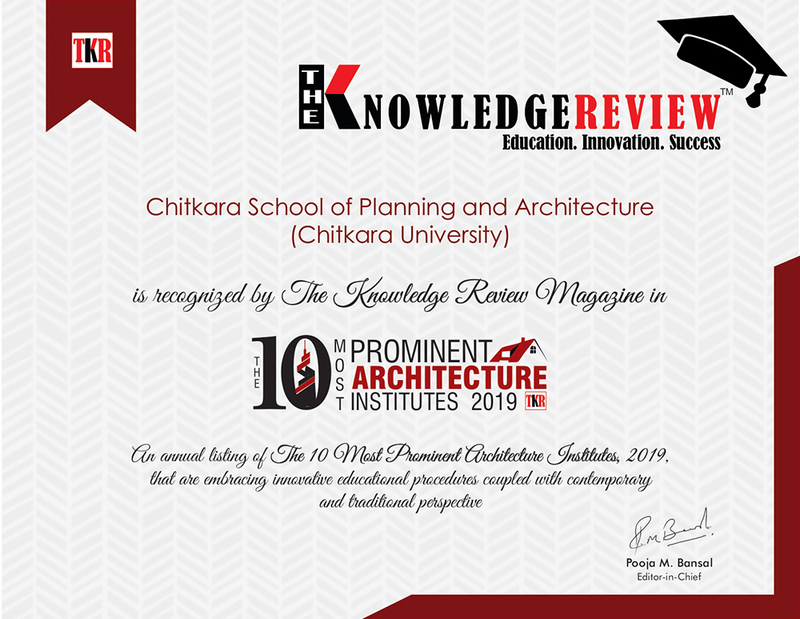 Chitkara School of Planning & Architecture has been recognised by ‘The Knowledge Review Magazine’ in the annual listing of ‘Top 10 Most Prominent Architecture Institutes 2019’ that are embracing innovative educational procedures coupled with contemporary and traditional perspective. The Knowledge Review came up with a special issue ‘The 20 Most Promising Institutes for the year 2019’ which highlights some of the best institutes in India that are ensuring overall development of the students while maintaining a career-oriented approach. It showcases those institutes which have set a global standard in the field of education, innovation, research, training and career development initiatives. Established in the year 2004, Chitkara School of Planning and Architecture (CSPA), is approved by the All India Council of Technical Education (AICTE) and duly recognised by the Council of Architecture. The School is established on a 5-acre site within the University campus and has been designed in a way so as to offer the budding architects new ways to access design references, model buildings and present their ideas. The department houses well-equipped design studios, lecture theatres and library with more than 4,000 books and collection of periodicals, to refer from. We also boast of world-class computing resources, including an audio-visual lab and a material museum. Instruction and research encompass design theory as well as visual studies, history, technology, and professional practice.